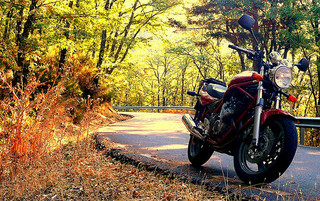 With autumn and autumn motorcycle riding officially here, the realization that the riding season is drawing to a close for many riders, shifts their focus from lavishing the dog days of summer to catching the final riding days before storing your bikes. Even though unseasonably warm weather and sunny skies can tease you, the unstoppable reality is that leaves are falling, temperatures are dropping and daylight is diminishing. Sunlight glare. The sun is lower in the sky and glare can be an issue for much of the day, unless you’re facing north. Along with this, as trees become barren of leaves, the patterns of light and shade can be like riding in a strobe light — and very distracting. Cold tires. While touring tires with their harder rubber compound are generally more suitable for cold weather, sportier tires are not. The sportier the tires, the softer the rubber. This is fantastic in hot weather and gives them their grippy characteristics which aid traction. In the cold, they’re hard and that traction is greatly diminished. Cold riders. Riding in the cold is fatiguing and can cause greater impairment than moderate alcohol intake. Even when you’re wearing good gear and staying warm, the ambient temperature takes its toll. You don’t notice it when you’re riding, especially over long distances and it can be startling when you stop to realize how tired you really are. Staying hydrated and taking regular rest stops helps keep you alert. Improper gear. Bundling up with lots of layers can seem like a great strategy for dealing with fluctuating temperatures. However, too much bulk is not only fatiguing, it can impede your ability to react. Heated gear is a fabulous invention. You need fewer layers and it effectively—and comfortably—extends the riding season. Fewer riders out. This means that car drivers, who don’t see you at the best of times, are now expecting to see motorcycle riders even less often. Be more cautious and alert. Make yourself as conspicuous as possible and assume they don’t see you. Isolation. Scenic back roads which weave through quaint small towns, particularly in tourist areas, have a whole different feel to them in autumn. Seasonal businesses close and rest stops and favorite watering holes may not be available. Plan accordingly for gas, food, lodging and emergency contacts. Autumn is a beautiful time to ride. There is less traffic on back roads, the fall colors are spectacular and the air is clear and crisp. Once the leaves have fallen, the underlying rocks and terrain become visible. You can see much further and you note things that were always there but covered by foliage. Autumn hazards aren’t necessarily greater than during other seasons – only different. The challenge is being prepared—not complacent. The rewards are immeasurable. Thank YOU Chris! Happy – and safe Autumn riding! You forgot walnuts. You really don’t want to run over walnuts, or you become roadkill. They are like walking on marbles. Avoid walnuts at all costs! Excellent addition Kelly. I was hiking on the Bruce Trail yesterday and they were all over the path. Not good to walk or ride on! Add in pine cones. Traveling through the mountains, the shoulder of the road can be very narrow -or absent and the pine cones drop right onto the road. Thanks for great list, Liz! Riding this autumn I have experienced virtually every one of these hazards including ending up on gravel roads a couple of times as I sought even more scenic routes. I hung in ’til I reached pavement, but what a challenge on my little cruiser. A strategy that I’ve adopted that has helped with the sometime blinding sunlight is to choose west-east routes in an effort to keep the sun at my back (and out of my face). Kudos for hanging in there Chris. And thanks for the great tip. Thanks Sienna. I hope you had a great ride – and a wonderful Thanksgiving weekend! If any come to mind that didn’t make my list, let me know. Fall is my favorite time of the year to ride. Great comments on fall riding. Thanks John! It’s mine too!